The Transmission Curves and Refractive Index Data represent typical optical material properties of eSource Optics standard Windows, Lenses and VUV-UV Filter & Mirror Substrate materials (based on ~2-3mm Thickness). Materials transmittance can vary slightly and this data should be used as a reference only. 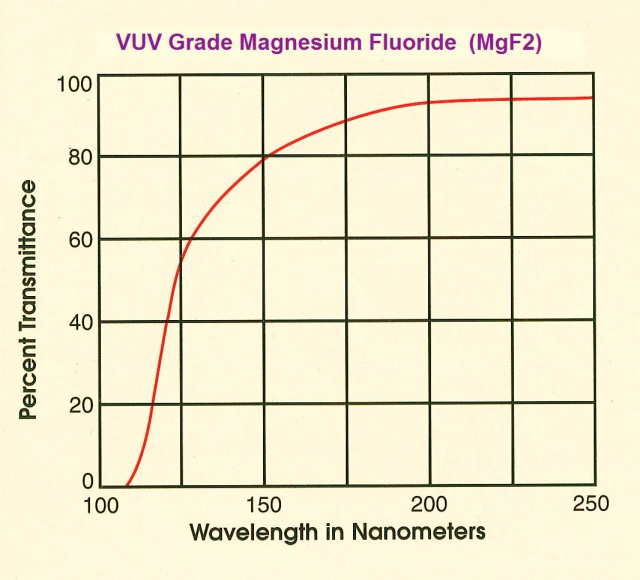 VUV Grade Magnesium Fluoride: VUV Grade Magnesium Fluoride (MgF2) exhibits high transmission properties from ~ 110nm Vacuum UV (VUV) to ~ 6.0um in the Infrared. VUV Grade MgF2 is a relatively hard crystalline material resistant to mechanical and thermal shock. VUV Grade MgF2 is a birefringent crystal typically oriented along the optical axis to avoid birefringent effects in windows & lenses. The Refractive Index data listed below is the nominal average 'N' data for both the Ordinary (o) & Extraordinary (e) Rays. 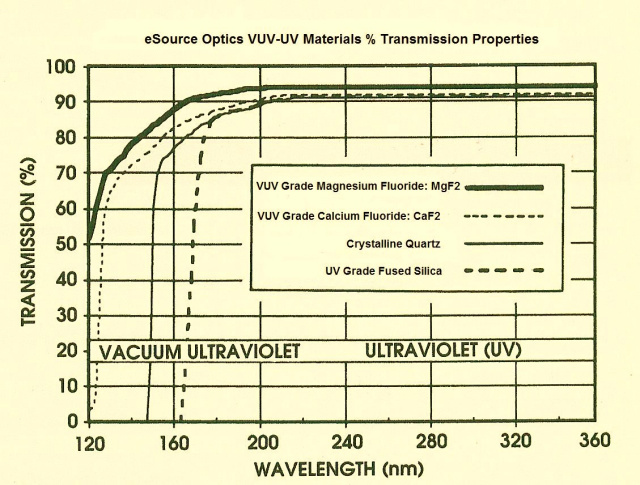 VUV Grade Magnesium Fluoride (MgF2) is used as the substrate material for all eSource Optics VUV Narrowband Optical Filters from 120-130nm. 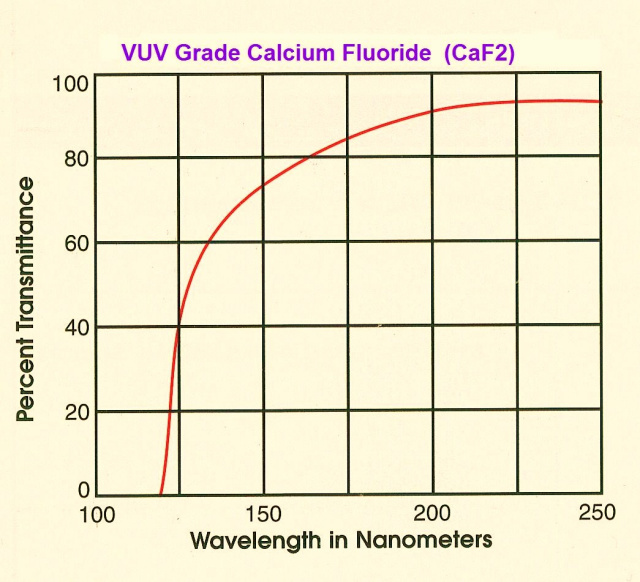 UV Grade Calcium Fluoride: UV Grade Calcium Fluoride (CaF2) exhibits good transmission properties from ~ 140nm Vacuum UV (VUV) to ~ 8.0um in the Infrared. UV Grade CaF2 is a relatively soft crystalline material and care should be taken as CaF2 is sensitive to mechanical and thermal shock. UV Grade CaF2 is a cubic single crystal optical material. UV Grade Calcium Fluoride (CaF2) is used as the substrate material for all eSource Optics VUV Optical Filters from ~130-150nm depending on FWHM. Sapphire: Sapphire (Al2O3) exhibits good transmission over the range extending from ~ 150nm in the Vacuum UV (VUV) to ~ 5.0um in the Mid-Infrared. Sapphire is an exceptional hard material; is chemically inert and insoluble to water, common acids, or alkalis at temperatures up to ~1,000 °C. Sapphire is typically oriented so that the c-axis of the crystal is parallel with the optical axis. 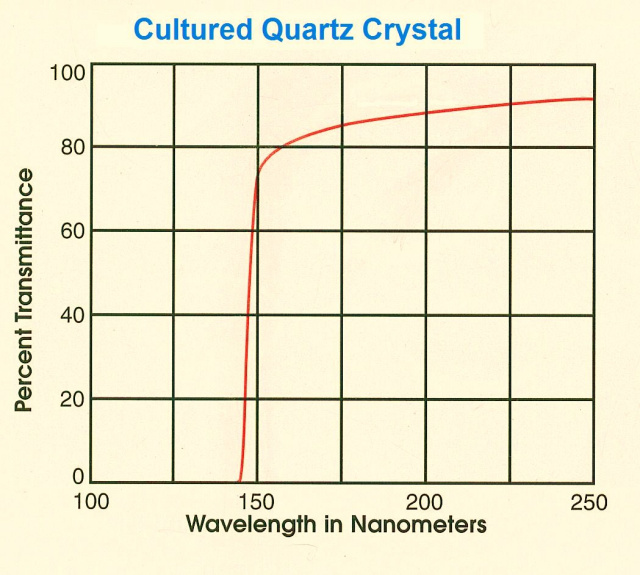 Cultured Quartz Crystal: Quartz Crystal exhibits good transmission properties from ~ 147nm Vacuum UV (VUV) to ~ 2.5um in the Infrared. Quartz Crystal is a very hard crystalline material with low thermal expansion coefficient. Quartz Crystal is a grown crystalline form of Silicon Dioxide (SiO2) optical material. Quartz Crystal is used as the substrate material for all eSource Optics VUV Optical Filters from ~150-170nm depending on FWHM. 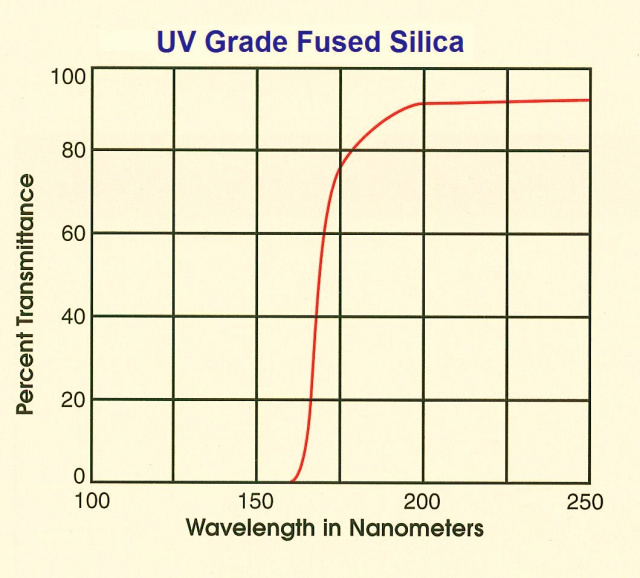 UV Grade Fused Silica: Synthetic form of silicon dioxide made from SiCl4 ,which transmits light over a very broad range of wavelengths from ~ 170 nm to 2.5 µm. UV Grade Fused Silica is a high-purity material which has excellent thermal stability, high transmittance and is used as a UV to NIR material for many optical components. UV Grade Fused Silica is used as the substrate material for all eSource Optics VUV-UV Optical Filters from 180-320nm. the material). 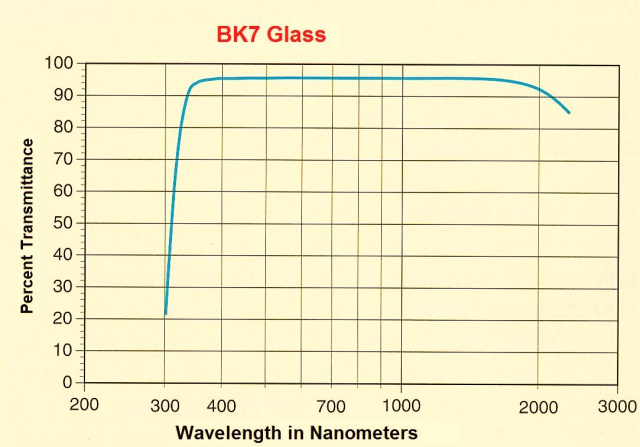 BK7 is an excellent visible to NIR material for many optical components.